What is the Society for Maternal-Fetal Medicine? Established in 1977, the Society for Maternal-Fetal Medicine (SMFM) is a non-profit, membership organization based in Washington, DC. With more than 3,500 physicians, scientists and women's health professionals around the world, the Society supports the clinical practice of maternal-fetal medicine by providing education, promoting research and engaging in advocacy to optimize the health of high-risk pregnant women and their babies. SMFM hosts an annual scientific meeting in which new ideas and research related to high-risk pregnancies are unveiled and discussed. 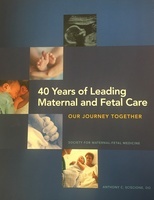 In 2013, the Society published a book detailing the history of SMFM and its sister organizations. The complete book is available online here. Have questions or need assistance? Please visit our Staff Directory to find a list of all SMFM staff, their positions, and contact information.